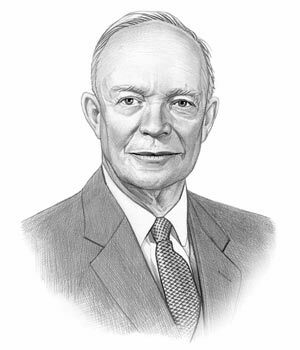 Summary of President Dwight Eisenhower for Kids: "Ike"
Summary: Dwight Eisenhower (1890-1969), nicknamed the "Ike" or "Duckpin", was the 34th American President and served in office from 1953-1961. The Presidency of Dwight Eisenhower spanned the period in United States history that encompasses the events of the Cold War Era and the age of the Space Race and the Cold War Arms Race. President Dwight Eisenhower represented the Republican political party which influenced the domestic and foreign policies of his presidency. The major accomplishments and the famous, main events that occurred during the time that Dwight Eisenhower was president included the End of the Korean War in 1953 and the outbreak of the Vietnam War (1955 – 1975), the formation of SEATO, the Brown v. Board of Education (1954), the Interstate Highway System and the establishment of NASA. The Civil Rights Movement gained momentum with the 1954 Brown v. Board of Education legal case. Federal troops were sent to Little Rock to enforce integration and Rosa Parks sparked the Montgomery Bus Boycott led by Martin Luther King Jr. Dwight Eisenhower died of heart disease on March 28, 1969, aged 78. The next president was John Kennedy. The summary and fact file of Dwight Eisenhower provides bitesize facts about his life. The nickname of President Dwight Eisenhower provides an insight into how the man was viewed by the American public during his presidency. The meaning of the nickname "Ike" refers to his boyhood nickname and was used in his presidential campaign with the slogan "I like Ike". The character traits of President Dwight Eisenhower can be described as outgoing, friendly, honorable, honest, optimistic and superstitious. It has been speculated that the Myers-Briggs personality type for Dwight Eisenhower is an INTJ (introversion, intuition, thinking, judgment). A reserved, analytical and insightful character with a strong sense of independence. Dwight Eisenhower Personality type: pragmatic, logical, individualist and creative. Summary of the Cold War: The Cold War (1945 - 1991) was a 'war of words' involving the Cold War Space Race and the Cold War Arms Race involving the nuclear build-up between the USA and the West and the Communist countries dominated by the USSR and China in the East. Dwight D Eisenhower was one of the nine US Presidents who were in office during the dangerous period in history known as the Cold War in which the US adopted the policy of Containment to restrict the spread of communism abroad. Summary of Sputnik: Sputnik was the first artificial satellite to orbit Earth, launched by the USSR on October 4, 1957. The Sputnik satellite made an orbit every 96 minutes and became a constant reminder to Americans of Soviet space supremacy. Summary of the Warsaw Pact: The Warsaw Pact was rival alliance to NATO and was signed on May 14, 1955 by the Soviets and its 7 communist 'satellite nations' in Eastern Europe consisting of Bulgaria, Czechoslovakia, East Germany, Hungary, Poland, Romania and Albania. The 1955 Warsaw Pact created a coordinated defense among its communist nations to deter any form of attack from the West. Summary of NASA: The National Aeronautics and Space Administration NASA was created in 1958 during the Dwight Eisenhower presidency in order to coordinate research in rocket science and space. Summary of SEATO: The Southeast Asia Treaty Organization, known as SEATO, was formed during the Dwight Eisenhower presidency as the Southeast Asian version of NATO. Summary of the U-2 Incident: The U-2 Incident involving U-2 high altitude spy plane flown by pilot Gary Powers that was shot down over Russia on May 1, 1960. Gary Powers was eventually exchanged for the Soviet spy Rudolf Abel made across Berlin's Glienicke Brucke bridge and is featured in the 2015 movie the Bridge of Spies. Summary of Area 51: Area 51, part of the top secret US Military base in Nevada, drew attention during the Cold War in which covert technological experiments on weapons systems and aircraft, such as the U2 stealth plane were conducted. Summary of the Interstate Highway System: Construction on the federal Interstate Highway System started on June 26, 1956. Its length covered nearly 50,000 miles and began a new road culture and the automobile society during the Dwight Eisenhower presidency. Summary of the Eisenhower Doctrine: The Eisenhower Doctrine was based on a speech that President Dwight Eisenhower made to Congress on January 15,1957, in line with the US Containment policy, in response to the Suez Crisis in which the Egyptian President Nasser had accepted aid from the USSR. Summary of the Brown vs Board of Education: The segregation practices in the U.S. school systems were challenged in the Brown vs Board of Education case that resulted in the Supreme Court banning the practice of school segregation, effectively overturning the "separate but equal" doctrine of Plessy v. Ferguson. Summary of the Civil Rights Movement: The Civil Rights Movement began in 1954 with the legal case of Brown vs. Board of Education followed by the 1955 Rosa Parks protest and the Montgomery Bus Boycott. Summary of the Montgomery Bus Boycott: The Montgomery Bus Boycott (December 1, 1955 - December 21, 1956) was the protest against segregation on buses, sparked by Rosa Parks, and organized by Dr. Martin Luther King, Jr. resulting in the integration of the Montgomery buses in Alabama. Summary of the Little Rock Nine: The Little Rock Nine crisis erupted on September 4, 1957 involving the admission of 9 African American students to Little Rock's Central High School. Summary of the Civil Rights Act of 1957: The Civil Rights Act of 1957 was passed by Dwight Eisenhower to prohibit attempts to intimidate or prevent African Americans from voting and succeeded in showing that the Federal Government would not allow the southern states to do as they wished. Summary of the SNCC: The Student Nonviolent Coordinating Committee (SNCC) was founded in April 1960 by Ella Baker, a Civil rights activist who had worked for the NAACP and the SCLC, to assist student Civil Rights activists and organize 'Sit-ins', Freedom Rides and Voter protests throughout the Deep South. . The article on the accomplishments of Dwight Eisenhower provides an overview and summary of some of the most important events during his presidency. The following Dwight Eisenhower video will give you additional important history, facts and dates about the foreign and domestic political events of his administration.